Subject: Re:Notre Dame burning down. EDIT: Apparently French billionaire François-Henri Pinault intends to donate 100 million Euro for the restoration of Notre-Dame. For thirteen years I had a dog with fur the darkest black. For thirteen years he was my friend, oh how I want him back. I saw this on my phone. Just terrible. So much history, irreparably damaged. Subject: Notre Dame burning down. What a travesty, I'm thankful that a lot of the artwork and artefacts were saved, but still that is a lot of crazy damage on such a historic place. Gotta hate that bitter taste of irony of this coming from an attempt at renovation. My milkshakes bring all the boys to the yard and they're like, hurr darry darr. My suggestion to you is to get married, if you have a good wife you'll be happy, if you have a bad wife you'll become a philosopher. I think people are a little hasty saying this is an accident. Seems like a sign to me. A sign they hired the cheapest workers available? It reminds me of Ecco Homo from a few years back, the picture of Jesus that came out looking like a monkey in restoration. Surely with a structure of importance like this you'd get a team who is aware of potential hazards like this. Like getting some rando to do work on the Eiffel Tower who then cuts through one of the structural supports. I went there when I was much younger, but I don't really remember it well. Damn. One of the most iconic structures in the world. Also a clear influence on 40k’s architecture. There goes another piece of history. One less reason to visit France now, I guess. This is one of THE MOST documented buildings in the world. Given enough time and money, it can be rebuilt, though maybe they can leave the lead tiles off this time for something less poisonous. Copper works well enough. A sign that maybe somebody is upset with the church? You don't get to pick and choose your signs from God. Actually, that's exactly how "signs from ghod" work. You DO get to cherrypick the specific ones that support your pov. It's not like Ghod is going to contradict you, izzit? The morning after, things are looking a bit better than last night. The roof is gone and the spire (which was a 19th century rebuild.) I don't think they know about the stained glass windows yet, which will be a great loss if they are gone. On the plus side, the main stone structure and the two bell towers are intact, and the firefighters managed to get most of the artworks out of the building. It's a pretty shocking ordeal, I was only there two years ago and it was a beautiful sight. Could have been worse, but something like should never have happened. The video of the spire falling is stomach turning. These Disney live-action remakes are getting out of hand! Actually that's a good point - maybe Ubisoft spending ridiculous sums of money to replicate Notre Dame for Assassin's Creed won't turn out to be a ridiculous waste afterall, if they still have and will turn over the image archive they must have generated for reference purposes. I do wonder if they've got the original architect's plans for the building? Can you imagine the wealth of archaeological knowledge that could be put to the test if they go for a literal 'original tech only' rebuild, rather than modern equivalents? And the French have form for that via Guedelon Castle. Make a TV series to go with it, and that's a chunk of the associated costs sourced too. IIRC none of the glass in any of the rose windows was actually original, but rather from the 1860s rebuild. I think the real testament of this event is to the masons that built the vaulted ceiling. Most of it held and protected much of the innards from complete destruction. There's an image going around the web with the main altar cross still standing defiant, a lá St. Paul's during the Blitz. A Swedish professor of history put it pretty well (paraphrasing from memory): "All Cathedrals burn. As long as they are not completely wiped out, they can be rebuilt, adding yet another layer to the history of the building." Considering how the Notre-Dame of Reims, another Gothic Cathedral, was badly damaged by artillery in both world wars but rebuilt anyway there is good hope that Notre-Dame of Paris will weather this storm. I'm sure it will weather the storm and be rebuilt. Heck some in the future might look back and argue the fire was a good thing since it might generate a huge investment that lets them renovate rebuild and update large swathes of the structure in one go. It might even relax some of the protections on it as its a rebuild. Sometimes laws regarding listed and protected buildings can result in them having unsafe, dangerous or just very expensive and hard to source/replace/improve structural elements. A full burnout might well let them come to the table and make key changes - eg they might change the lead to something that looks like lead but isn't lead. A modern Notre Dame for a modern France, whilst still retaining much of its historical artistic charm. Good point. I like the approach the Italians take in those regions of the country that have to be "quake-safe": when you restore an old building, it has to look like original work, but they don't place ridiculous demands on using medieval mortar, or stone sources from a particular quarry, or any of the other nonsense listed buildings have to deal with in some countries. Aye I can see value in keeping things as they were and preserving such knowledge and structural designs and the like - but at the same time they can be a huge barrier and sometimes structures can easily fall into dilapidation because to repair within the protection laws is just too great a cost. So you end up losing the structure anyway, just over a very prolonged period. Reports are comning in that the 15th century organ is intact. 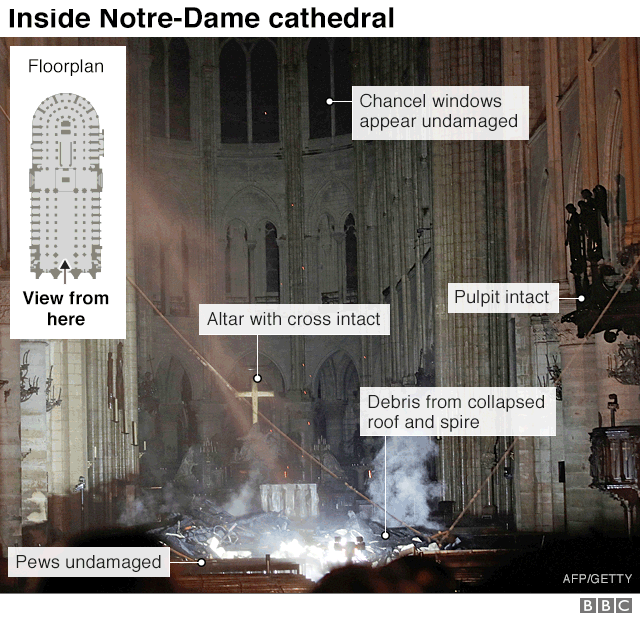 Images seemingly confirm the survival of the chancel windows above the altar as well (see below, courtesy of the BBC). Well could have been worst. With treasures safe it should be just reconstructing it. Expensive yes but doable. And as said above can be used to do improvements without changing looks. Sad event but silver lining being worst dodged. Albeit my PV might be coloured bit by having been to Japan where many of the old famous buildings have been rebuilt over again and again through history when they keep getting burned down(one seem to have got sick and tired of that one so rebuilt temple into concrete block...) so I have no real issue with reconstructing buildings. There's a short video of a man in middle eastern garb walking around in the upper areas near the roof. Because when I sneak onto a worksite to burn one of the most iconic buildings in the world to the ground, I always wear the most inappropriate and visible clothing I can get my hands on. Clipboard and hardhat for the win. Trump: "Yeah, that’s her. With the fiat currency. I better use some Tic Tacs just in case I start kissing her. You know, I’m automatically attracted to beautiful countries — I just start kissing them. It’s like a magnet. Just kiss. I don’t even wait. And when you’re a star, they let you do it. You can do anything. Grab ’em by the electoral college. You can do anything." It's a construction worker, clearly visible in higher resolution versions of the clip. I'll see if I can find it. How do I link videos that aren't YouTube? Perhaps it's just me, but I find my eyebrows raising at how quickly the hundreds of millions of Euros are donated to repair a building owned by one of the wealthiest organisations in the world; as compared to much smaller charities/causes who could do so much good with that kind of money. It's like watching the millions disappear at the whiff of old Boris' garden bridge. Don't get me wrong, Notre Dame is nice and all. But there are a lot of cathedrals in the world, and many better uses that money could have been put to. Perhaps it's just me, but I find my eyebrows raising at how quickly the hundreds of millions of Euros appear to repair a building owned by one of the wealthiest organisations in the world; as compared to much small charities/causes who could do so much good with that kind of money. It's owned by the French state but the Catholic church has exclusive access in perpetuity. That I didn't know, but it doesn't change my feeling one iota. Macron was pledging to rebuild long before the donations rolled in; which was nice of him. It's funny how politicians seem to loose the purse strings whenever a large scale vanity project which they can attach their name to appears; but playgrounds for deprived children, disability grants, or getting the homeless off the street struggle to attract a fraction of that kind of funding. True, but what could he say? "Nah, the single most iconic landmark in France can go get bent"? He really has no choice, anything that isn't "rebuild it!" is political suicide.